If I were to describe this even further, I found this chili recipe to be a cross between a stew and chili. It really takes the best of both and combines them together! 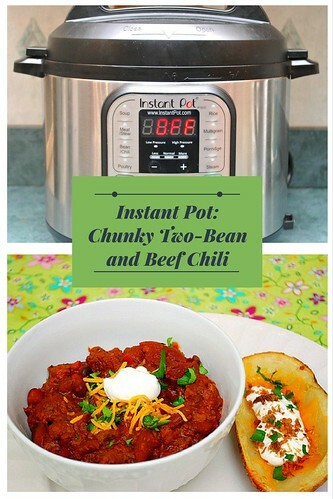 The bonus is that it's gluten free to begin with and it's a great make ahead meal that's also freezer friendly. Press SAUTE and add oil to IP. Place half of beef in pot and season with salt & pepper to taste; sauté 5-7 minutes or until browned. Remove from pan. Repeat procedure with remaining beef; remove from pan. To the now empty IP pot, add 2 teaspoons oil, onion, and bell pepper, and sauté for 3 minutes. Add garlic and jalapeño; sauté for 1 minute. Add wine, scraping pan to loosen browned bits. Return beef to pan. Stir in the remaining ingredients (spices, tomatoes and beans) until evenly combined. 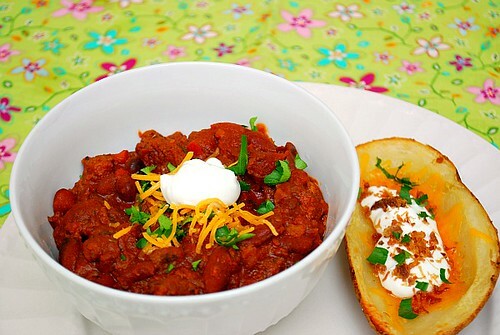 Ladle the chili in bowls and serve with shredded cheese, sour cream, avocado or your favorite garnishes.